Teddy Blanks’s idiosyncratic synthpop reminds us of a sundae: these songs are as rich as they are pretty. Recorded in his closet, these anthemic ballads are part Michael Jackson, part Smiths, and with their soaring melodies and witty, vulnerable lyrics, they have us laughing, crying, dancing, and hitting repeat—sometimes all at once. Teddy—who also scored Lena Dunham’s Tiny Furniture—chatted with us about everything from fantasy luncheons to cough drops. Therapy, his first full-length album, was released in May. It’s available for download here. Teddy was kind enough to share an unreleased track, “Spider Leg”, which you can stream below. The first single off your album is called “Famous Friends.” If you could arrange a friend-date (think: lunch + lazy outfits) with any two celebrities, living or dead, who would you pick and why? The album has some combination of goofy showboat-y musical theater lyrics with precise rhymes, and detached, ironic observations inspired by Talking Heads. So lunch would have to be with Stephen Sondheim and David Byrne. They’d be on completely different wavelengths, but I’d love to hear them talk about songwriting. You really belt it on some of these songs. Any secret tricks for relieving a singing-induced sore throat? Whenever I belt too much and I get to that place where my throat is raw, I just push through. That’s when the singing gets interesting. That being said, when I have a sore throat I usually buy Ricola. My problem is that when I have a bag of something sweet, I eat all of it very quickly, so a sore throat can easily turn into an upset stomach. Font: Glaser Stencil. It’s never really appropriate to use, but it’s the coolest 70s display typeface. TV commercial: Lyndon Johnson’s 1964 re-election commercial, which features a little girl counting flower petals juxtaposed with a nuclear countdown and explosion. It’s ballsy, terrifying, and beautiful. And no way would a presidential candidate get away with it nowadays. Book cover design: There’s this one hardcover edition of Doris Lessing’s Briefing For A Descent Into Hell that I got at a vintage bookstore that has the most amazing custom type. 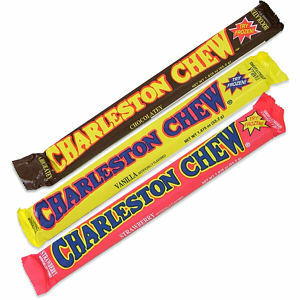 Candy wrapper: Charleston Chew. It looks like it hasn’t been redesigned for 50 years. Office supply: Gotta be the pushpin! Any other multitasking creative people whose work you particularly appreciate? Atul Gawande, whose essay I based my first solo EP Complications on, is a staff writer at the New Yorker; he’s published three bestsellers, is a professor of surgery at Harvard, and a full-time surgeon. To multi-task at that level and be the very best at all of the things you do is mind-blowing. Complete the sentence. The person whose therapy sessions I’d most want to sit in on is…. Brian Wilson, when he was under the 24-hour care of Eugene Landy. For over 15 years, his whole life was literally one long therapy session.